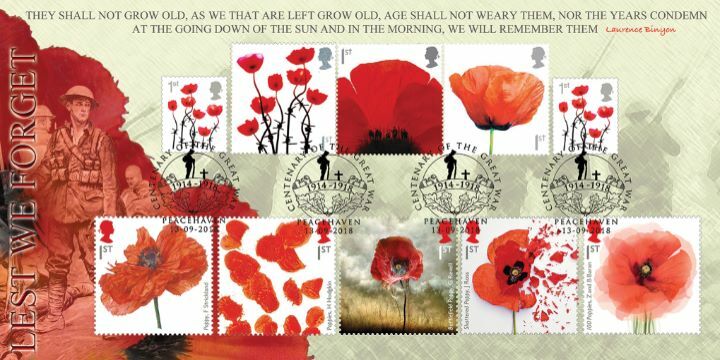 Notes: The COMPLETE collection of NINE different Royal Mail poppy stamps on one superb cover. These stamps were issued in 2006, 2007, 2008, 2013 (x2), 2014, 2015, 2016, 2017 and 2018. The above Royal Mail The Great War stamps were issued on 13 September 2018 by Royal Mail and feature the following stamp designs: 1st Poppy; 1st Poetry; 1st Portrait; £1.55 War Art; £1.55 War Memorial; £1.55 Artefacts. The The Complete Poppy Collection first day cover with the Peacehaven, Soldier at grave, Special Handstamp postmark has been produced by Bradbury and features these stamps which can make a very collectible and lovely gift.